Back in the day, sandwiches were everything. Just think about your school lunches. All the good stuff packed up in your lunch box could be found between two slices of extra-fluffy white bread. Unfortunately, the cool-factor of sandwiches declined as fancy wraps made with spinach tortillas rose among the ranks. Well, here’s some good news: Healthy sandwiches are making a comeback. Instead of the bologna and cheese sandwiches of yesteryear, these healthy sandwiches are actually good for you. You don’t need packaged goods from the deli aisle of the supermarket (which, BTW, is not that great for you) to fill the space between your bread. 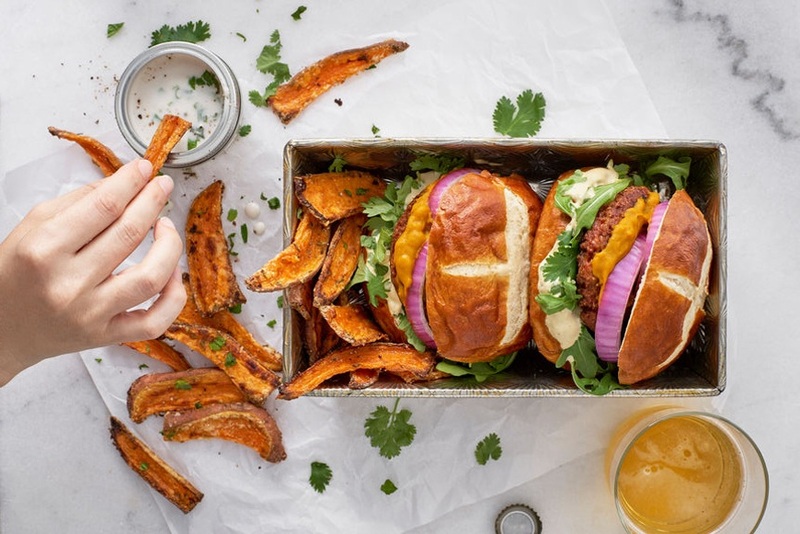 And many food bloggers are jumping on the chance to give sandwiches a serious upgrade, creating creamy plant-based spreads and piling the wholesome ingredients high. The next time you’re planning your lunches for the week, give sandwiches another chance. With the right ingredients, you can reintroduce healthy sandwiches to the mix and kiss wraps goodbye. This sandwich is filled with a flavorful combination of hummus, avocado, alfalfa sprouts, black olives, and pickled red cabbage. Instead of spreading regular hummus on your sandwich—which is delicious in itself!—switch things up with an option made from vitamin-packed carrots. Whether you’re in the mood for a purple mix of beetroot and purple cabbage or a red mix of sun-dried tomato paste and red peppers, these colorful combos are sure to please. Happy Friday! Just popping in to remind you that leftover roasted sweet potato makes the most amazing fall sandwich addition- especially when you’re lucky enough to find purple sweet potatoes at the market! I linked my super easy #vegan sandwich post in my bio Incase you need some sammie ideas for the weekend! Who knew avocados, roasted sweet potatoes, and beets made such a winning combination? All you need is some smashed avocado and chickpeas, red onion, cucumber, and broccoli sprouts for a melt-in-your-mouth lunch. If you want a true blast from the past, try this healthy sandwich made with sliced bananas, peanut butter, dried black currants, strawberries, and chocolate tahini. Here’s why to embrace the chic adult lunch bag even if you’re not going back to school. Or, check out some more on-the-go lunch ideas that will fuel you all week long.